These brightly colored liquor bottle pourers are a great way to keep your alcohol flow under control. Simply slip one into the top of your liquor bottle for a more manageable, much smoother pour. With 12 included, you'll be ready to dispense all of the most popular spirits behind your bar. 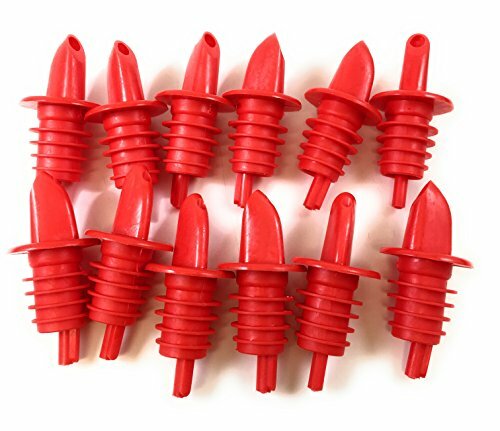 Pour spouts are made of plastic and fit most standard size liquor bottles. In stock and ready to ship. Features: made of plastic. Choose from a variety of colors. Provides a more controlled pour. Fits most standard size liquor bottles, may not fit over sized bottles. Specs: dimensions: 1 1/8"W x 2 5/8"H. Includes: (12) pourers. If you have any questions about this product by Barwareaffair, contact us by completing and submitting the form below. If you are looking for a specif part number, please include it with your message.